There's a lot of buzz lately about Cloud Based SIP Service. Telecom terminology can get confusing, especially when these terms all sound like they accomplish the same things. Please take a moment to read the overview below and well do our best to demystify the jargon surrounding The Cloud and SIP. We offer Cloud-based SIP solutions for nearly every application. Understand the term SIP and how it relates to the Cloud. SIP is an acronym for Session Initiated Protocol but like most telecom labels, once you know what it stands for, it still doesnt make much sense. So lets forget what its called and talk about how it works. 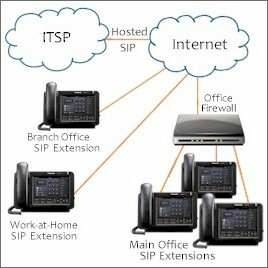 SIP comes in many flavors but the two most common forms are SIP Trunking and Hosted SIP. SIP Trunking replaces your telephone service, services like POTS or Plain Old Telephone Service (a.k.a. Analog Lines) and T1 or ISDN-PRI (a.k.a. Digital Lines). Hosted SIP not only replaces your telephone service but it also replaces your PBX or Key Service Unit (a.k.a. your Switch). With Hosted SIP, the only things you need are the actual telephones (a.k.a. Endpoints). Understand how SIP is delivered. Unlike conventional telephone service from a telephone company Central Office (a.k.a. The C.O. 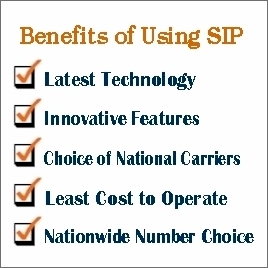 ), which is generally delivered to your door by wires or fiber optic cable, SIP is delivered via the Internet. 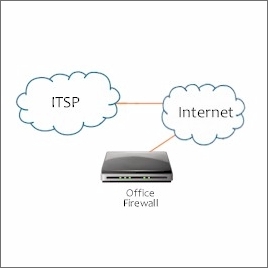 By using a router, you can establish service with any Internet Telephone Service Provider (ITSP) you choose, regardless of their location and connect it to any SIP compatible PBX or SIP Endpoint. Ask yourself if SIP is right for you. WHY SIP? Perhaps the best way to approach the subject is to first realize that SIP is here to stay. It WILL one day replace all other forms of voice telecommunication and it will do so within a relatively short period of time. There are several reasons for this migration but the main force that drives this shift is economics. The cost to maintain either overhead or buried cables continues to rise as the infrastructure ages. Other reasons for the transition include having a wider choice of competitive providers to choose from and each with more features than traditional services. Add to this, the availability of inexpensive telephone numbers from all over the world, and you have the answer. If SIP sounds right for you, keep reading or give us a call, toll-free at 866-205-4112. If you're not ready for SIP, please visit our applications-based telephone systems pages. 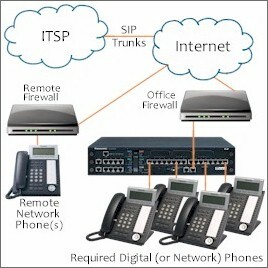 Decide on Hosted SIP or SIP Trunking. This is probably the easiest decision youll make. Either you want to have the Total Control and Compete Flexibility by owning your own PBX using SIP Trunking or you actually prefer to have another company manage it for you and deliver only the endpoint product - the telephone. Dont worry - we can help. Call us toll-free at 866-205-4112 for answers. WHEN IS HOSTED SIP A GOOD CHOICE? Hosted SIP is generally a good choice when few phones are involved at any one location, making the cost of owning a PBX, somewhat prohibitive. Another candidate for Hosted SIP might be a company comprised of mostly work-at-home employees. This allows each employee to converse at the same time and all without the cost of a PBX. If you start out using Hosted SIP Service and you find that your needs change and you want to upgrade to your own PBX, most provider will allow you to convert the service when the time comes. However, its best to get this in writing and we can show you how to do that. You still have a choice when it comes to the actual telephones - even with Hosted SIP .KX-TD.COM offers the widest selection of SIP endpoints available from a variety of manufacturers including Panasonic. And, we continue to test new ones as they are released. WHAT ARE SOME BALLPARK PRICES FOR HOSTED SIP? No seat charge but with higher per minute rate for both inbound and outbound calling. WHEN IS SIP TRUNKING A GOOD CHOICE? A large home with 20+ phones but only 1-3 phone lines. Any home or business (regardless of size or location), that needs an in-house PBX would benefit from SIP Trunking. People choose to own their own PBX for a number of reasons. Some of those reasons are because they prefer to have total control, have frequent configuration changes or they wish to integrate devices such as wireless phones, door phones, fax machines, paging speakers, predictive dialers or TAPI. With an IP compatible PBX, off-premise extensions are easily deployed to anywhere in the world so having multiple locations should not prevent you from using SIP Trunking. WHAT ARE SOME BALLPARK PRICES FOR SIP TRUNKING? Quality SIP Trunking providers generally charge by the number of concurrent calls that you can possibly make. These are called CCS or Concurrent Call Sessions. A competitive rate is about $10 per CCS. The math becomes quite simple. A company with a 8 lines should expect to pay just under $80 per month. There are no per seat charges so you can have one phone or a thousand phones and the monthly charge is the same. With SIP Trunking, there are few al a carte features available since the features come from your PBX. Exceptions to that are upstream features like Direct Inward Dialing (a.k.a. DID). Most SIP Trunking providers offer free calling for 48 states, Canada and a few of the islands but the cost per CCS is a bit higher. WHICH CARRIERS ARE ABLE TO PROVIDE SIP TRUNKING SERVICE? There are several carriers that purport to offer SIP Trunking Service, but here's where it gets a bit dicey. If you want things to go smoothly, you need to choose a carrier AND a dealer that are both SIP Certified by Panasonic. A Certified Carrier is one that has entered into an Interoperability Testing Agreement with Panasonic and has proven total compatibility. But it doesn't stop there. An Interoperability Testing Agreement also states that the carrier MUST purchase a Panasonic PBX in the model category for which they are seeking certification. They must test any proposed network changes using the Panasonic PBX to make sure that no Panasonic PBX is adversely affected. Still, before deploying any changes, they must notify Panasonic of these changes to give Panasonic an opportunity to also test the network changes. In order to facilitate this, Panasonic maintains live SIP Trunks from every Panasonic SIP Certified carrier so that these tests can be made in real time under actual conditions. Without such testing, you could find yourself without communications and no one would understand why. This is why Panasonic is the only Class A PBX in the world. Class B, C, D and E PBX's do not adhere to this strict policy. Another major benefit of having the carrier Panasonic Certified is that they can obtain technical support from Panasonic just as if they were a Panasonic Certified Dealer. Just as your carrier needs certification, your Panasonic Dealer must also be Panasonic Certified for all this to work. KX-TD.COM is factory certified on every KX series telephone product ever manufactured and in the rare case where Panasonic Engineers needs to be consulted, we have their ear. Below is a current and complete list of Panasonic SIP Certified Carriers. The X indicates which products they are certified in. Carriers listed in * BOLD TYPE * are Premier Carriers or carriers that tend to be the most responsive, most respectful and most trustworthy with your communications needs - regardless of how small or how large. This list is updated regularly. Upon request, KX-TD.COM will provide you with a Letter of Introduction to the carrier of choice, provide they have an Interoperability Agreement on file and are in good standing. Call us toll-free at 866-205-4112 for the lowest prices. We deal in volume, and are able to deliver the very best rates from multiple solution providers. We have a solution to fit your needs. Guaranteed.